Every owner of a commercial or residential property wants to maintain it neat and good – looking but all too often that's impossible without some professional assistance. From now on, you don't have to be afraid of the high prices because the most reliable company in London offers various cleaning services at the most reasonable prices in the region. Don't hesitate, book now. The web server with the IP-address 94.177.253.93 used by Cleanerswhetstone.net is owned by SmaNET Systems SRL and is located in Galati, Romania. This web server runs a few other websites, mostly in the english language. 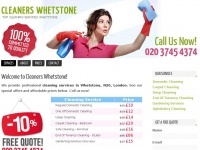 The websites of Cleanerswhetstone.net are served by a Apache server. The content management system WordPress in the version 4.8.3 is used. The HTML pages were created with the latest standard HTML 5. The website does not specify details about the inclusion of its content in search engines. For this reason the content will be included by search engines.